ITAS Diatec’s first season in A1 league started in 2000/01 and was accompanied by the opening of the new PalaTrento stadium (where the team would play all at home games). The opening took place on occasion of the first at home game against Padua with an audience of almost 3000 people. The team was able to consider itself safe on the penultimate day and the club closed the championship in twelfth position. Giombini, Goriuochev, Mester and Boskan were the first star players to wear the yellow-blue t-shirt and contribute to the team’s confirmation in premier league. 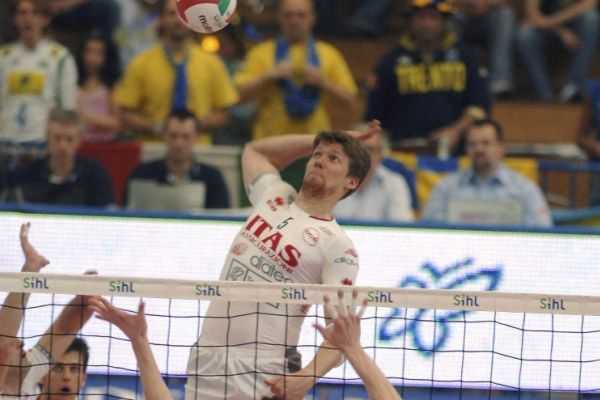 There were also two Trentino players however: middle player Alberto Marcolini and the very young opposite hitter Matteo Burgsthaler who would return ten years later as middle player after a long period spent between B1 and A2, making him a key player for the Italian cup in 2012 and championship in 2013.